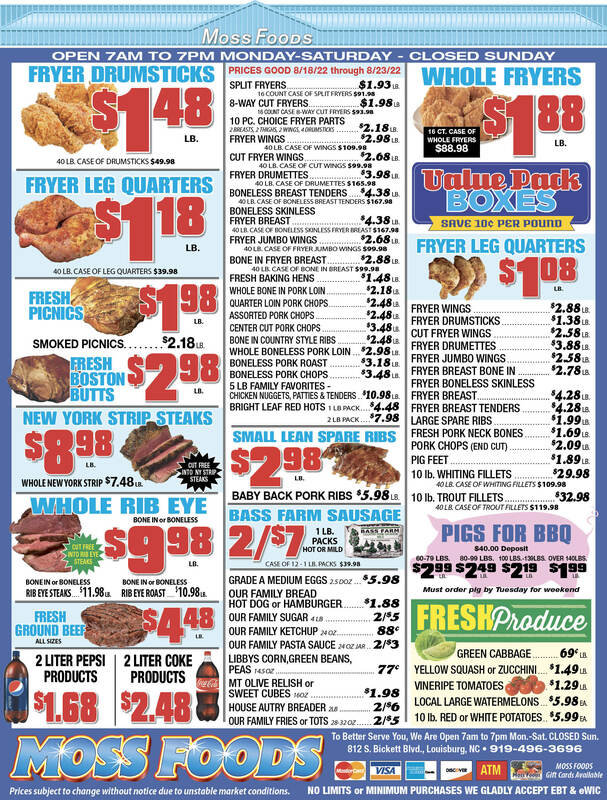 Showing 30 articles from November 1, 2017. LOUISBURG -- State environmentalists determined that an underground fuel tank at Franklin County's hospital site warrants no further action, clearing the way for Duke Lifepoint to take control of the health care facility. In September, county commissioners approved a lease with Duke Lifepoint to operate an emergency room, mental health unit and other hospital operations at the Louisburg site on Bickett Boulevard and Hospital Drive -- which formerly housed the Novant Health Franklin Medical Center. 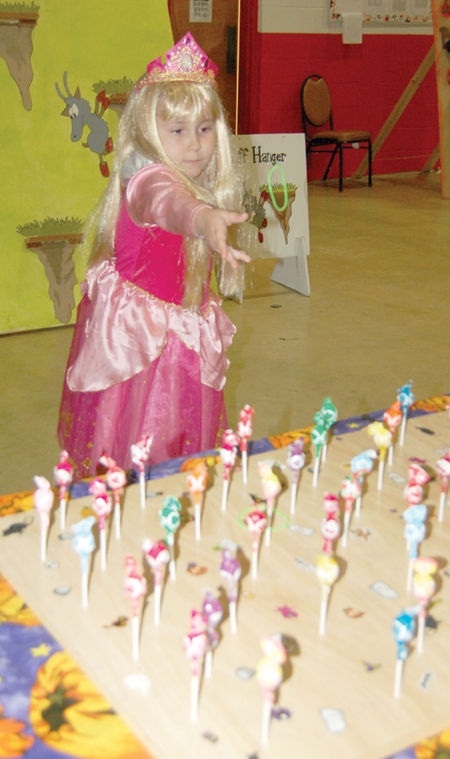 Sydney Grissom tosses a ring to win a lollipop and other prizes during the Halloween Carnival hosted by the Youngsville Kiwanis Club at the National Guard Armory. 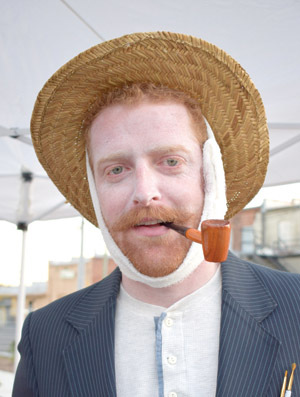 LOUISBURG -- "My life was not his to take." 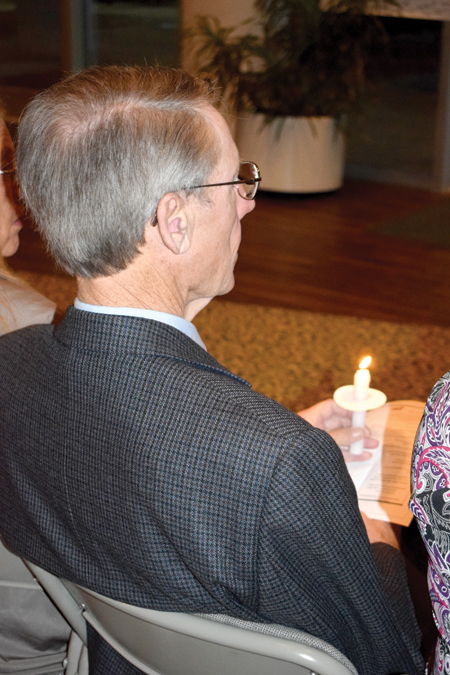 That line comes from a poem read by LaRue Joyner during Safe Space's 19th annual candlelight vigil last Thursday night entitled "Beyond Fear Is Freedom," to remember victims of domestic violence and to help focus efforts to end the problem. FRANKLINTON -- Residents got a chance to meet candidates digitally and in the flesh last week -- the last official candidates forum prior to the Nov. 7 election. Candidates were greeted with a wide-range of questions, from capital projects, to God in government, to the need for confederate monuments on public properties. The Greater Franklin County Chamber of Commerce and Franklinton hosted the Oct. 26 forum at Franklinton High School, inviting candidates from Bunn, Franklinton, Louisburg, Youngsville and Wake Forest to take part in the session. Did we learn from the light of a fiery crash? We ducked a bullet -- or, more precisely, a fiery inferno -- recently on Louisburg's Bickett Boulevard, but expecting that things will change because of it is likely expecting far too much. As you read in last week's edition of your Franklin Times, a pickup truck and a tractor trailer got tangled up at the intersection of Bickett Boulevard and Golden Leaf Drive (near Union Bank) and the larger truck quickly caught fire and was destroyed, despite the best efforts of firefighters. Back in the dark ages, say about 2010 if memory serves, an idea was tried in Wake Forest that we should consider reviving in Franklin County. Back then, the Wake Forest Parks and Recreation Committee sponsored a weekend when everyone was urged to turn off cell phones, computers and assorted other electronic devices and actually ... can you believe this? .... connect with each other as human beings! I'll let you in on a little secret: covering candidates forums is darn near impossible to do. There was a time when I was young and naive, and I just tried to craft a story I believed that readers would find interesting. It wasn't until later that I realized, and rather harshly, I might add, that navigating a candidates forum is like trying to navigate high school football allegiances in a small county -- everyone assumes you're biased or simply hate their team. HOLLISTER--Funeral services for Tyler Edward Lynch, 23, who died Sunday, Oct. 29, 2017, will be held Saturday, Nov. 4, at 12 p.m. in the Richardson Funeral Home Chapel in Louisburg, with the Rev. Marcellus Moore officiating. Burial will follow in the Tilman Lynch cemetery in Hollister. FINESSE GAME. 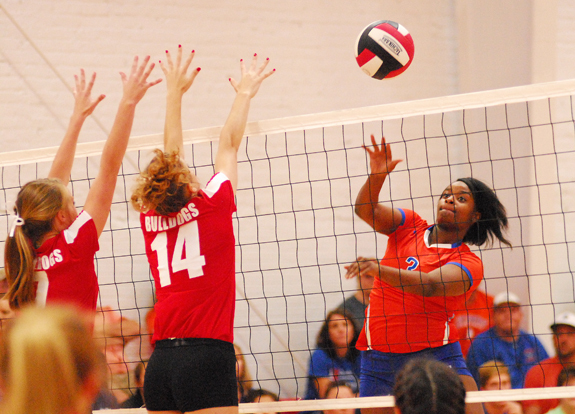 Louisburg High School's Ti'ashia Frazier (right) sends a tip past a pair of Roxboro Community School blockers during last Saturday's state quarterfinal volleyball showdown in Person. 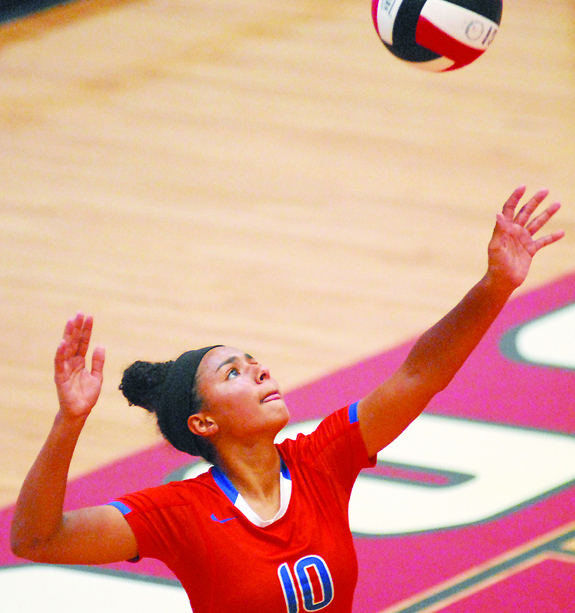 When the final pairings were released two weeks ago for the Class 1-A State Volleyball Playoffs, it was widely anticipated from both sides that No. 3 seed Louisburg and No. 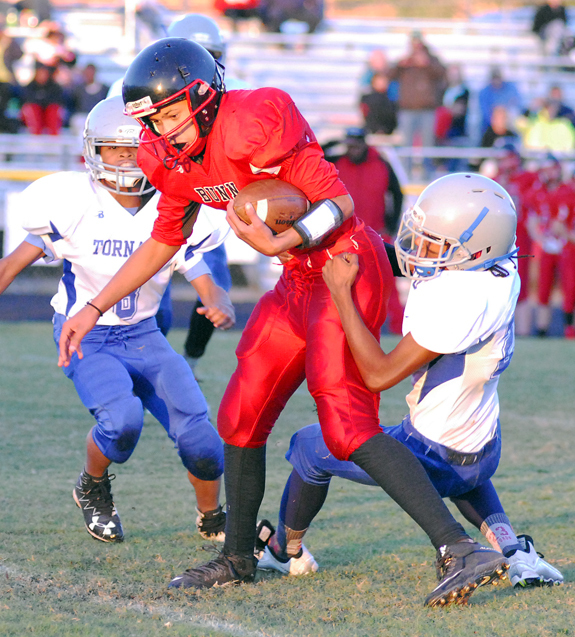 2 seed Roxboro Community would eventually meet in a quarterfinal showdown. RUNNING ROOM. Louisburg High School running back Xavier Jones (with ball) picks up yardage last Friday night against the Bunn Wildcats. 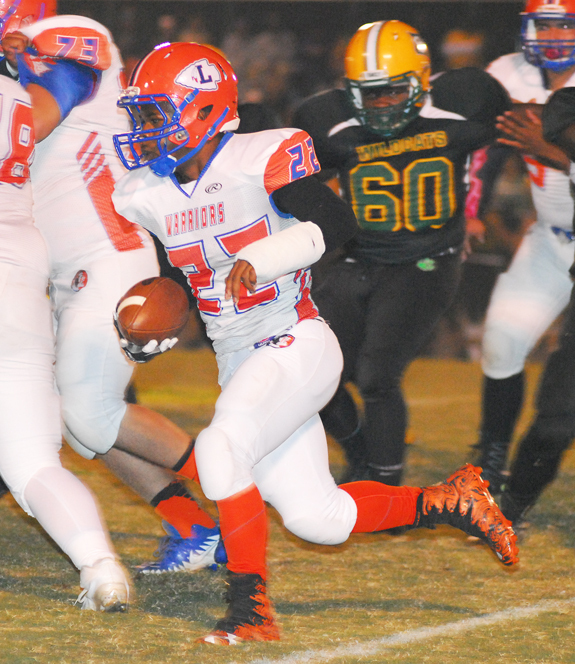 BUNN -- For Bunn and Louisburg, both squads' respective postseason football fates are more tied toward this week's Northern Carolina Conference schedule. Even so, the Louisburg-Bunn rivalry is always important to both sides -- and last Friday's NCC meeting was no different. Bunn entered the contest knowing that, regardless of the outcome, this week's game against Roanoke Rapids will determine if the Wildcats can hang on to the No. 2 seed out of the NCC for the Class 2-AA State Playoffs. TOUGH TO TACKLE. Bunn Middle School's Damarion Watkins (with ball) lunges for extra yardage during Monday's football contest versus Terrell Lane. BUNN -- Terrell Lane came up with a unique way to preserve its victory Monday over host Bunn Middle in a Middle Athletic Conference football rivalry showdown. After recovering a fumble at its own 1-yard line on the final play of the third period, the Tornadoes used up the entire clock with a single fourth-frame possession en route to edging BMS by a margin of 8-0 in the regular season finale for both clubs at the Bunn High School Football Field. RED OAK -- Clennie Wilkins knew there would be an adjustment period when his Franklinton High School cross country program made the off-season jump from the Class 2-A Northern Carolina Conference to the Class 3-A Big East Conference. Wilkins' assessment was played out in conference action as the injury-riddled Red Rams tried to keep up with established powers in the competitive league. KRISTEN CRUSHES ONE. Louisburg High School's Kristen House delivers a blast last Thursday against Camden County. LOUISBURG -- Late in a competitive opening set, Louisburg coach Erica Wammock called a time-out -- and decided to make a few in-match adjustments. 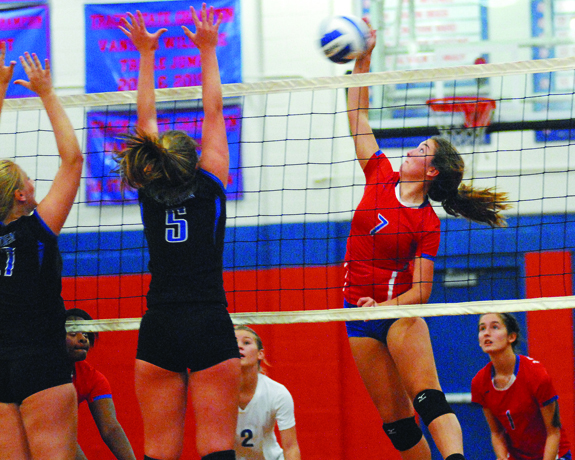 Wammock sensed that Camden County had received a good scouting report on LHS -- and were sliding over to double-block the Lady Warriors' strongside outside hitters. NELSONVILLE, OHIO -- For the second consecutive year, the Louisburg College Hurricanes have finished with an undefeated regular season record on the gridiron. LC capped off yet another successful campaign last Saturday as the Hurricanes rolled to a 45-28 decision at Hocking College in the Buckeye State. Louisburg, coached by Trevor Highfield, upped its mark to 8-0 overall. 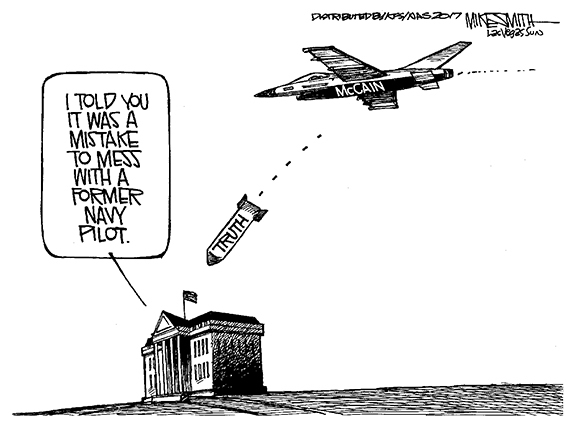 But both of those options took a hit last Friday -- and in the most heartbreaking fashion. YOUNGSVILLE -- The Town of Youngsville will hold youth basketball league registrations through November 15. Boys and girls in pre-kindergarten through eighth grade are welcome to participate. There are five different age divisions. 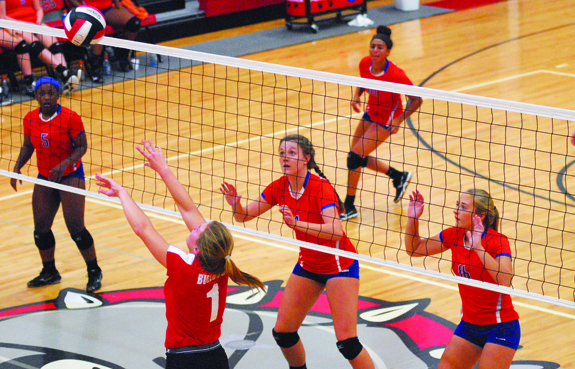 Louisburg's Whitney Bolton (center) and Adriane Sullivan (right) follow a set attempt during last Saturday's matchup against homestanding Roxboro Community School in the quarterfinals of the Class 3-A State Volleyball Playoffs. 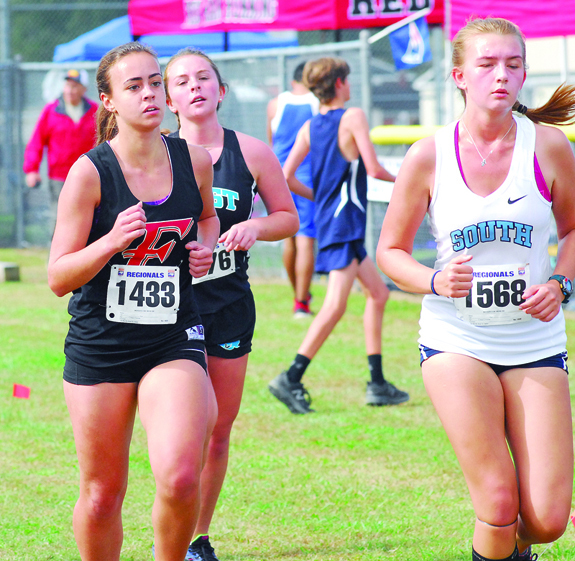 Franklinton's Rachel Black (left) prepares to make a move during last Saturday's Class 3-A East Regional Cross Country Championships, which were held at Red Oak Middle School in Nash County. 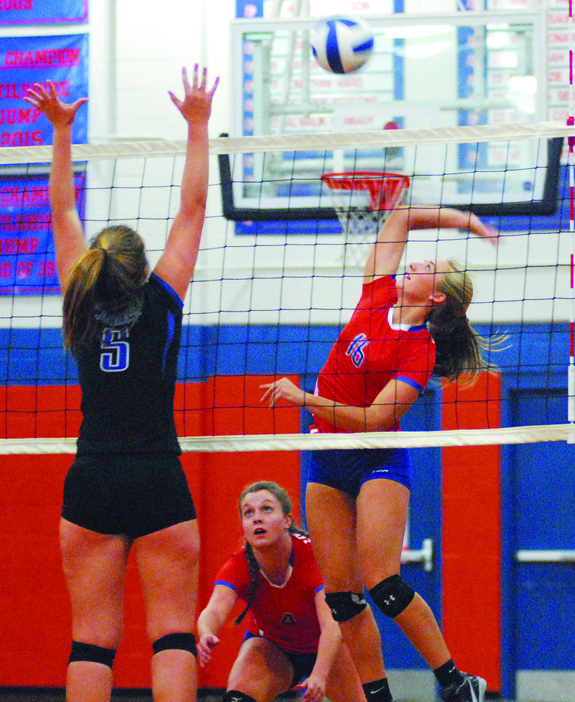 Louisburg High School's Adriane Sullivan (right) prepares for a kill attempt versus Camden. Louisburg's Kaylee Saunders prepares to rip a serve during last Saturday's meeting with Roxboro Community School in the quarterfinals of the Class 3-A State Volleyball Playoffs. SHE'S MARY POPPINS, Y'ALL. 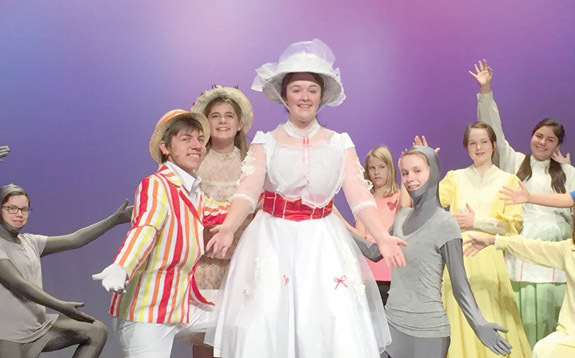 Mariah Massey, center, will join the rest of the Franklinton Area Community Theatre players in their presentation of Mary Poppins in the Franklinton High School auditorium. Massey is a senior at Franklinton High School and this will serve as her last starring role with FACT. Shows are slated for Nov. 3 and Nov. 4, with show times to begin at 7 p.m., and Nov. 5, with a 3 p.m. show time. Tickets are available at the door. HENDERSON -- Franklin-Granville-Vance Smart Start, Inc. is seeking nominations for two awards: Teacher of Excellence and Director of Excellence. The awards were established to promote the mission of Smart Start, which focuses on high quality child care for all children. IT'S OFFICIAL! 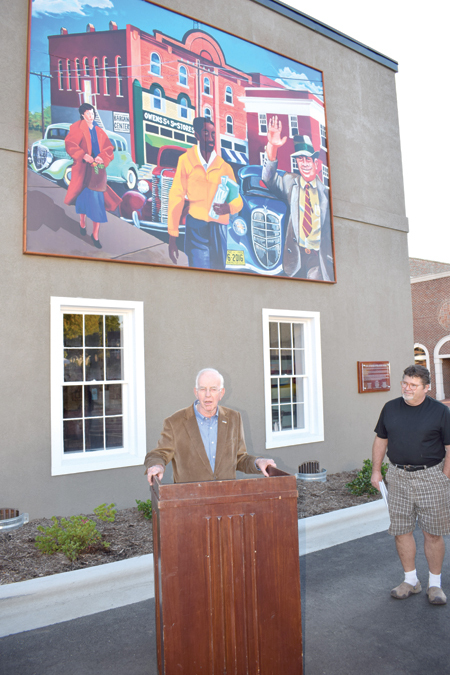 A plaque that explains Louisburg's downtown mural was formally dedicated Oct. 20, just prior to the town's OcTARberfest festivities that drew a large crowd for food, craft beer and music. In this photo, Mayor Karl Pernell talks about the project that was overseen by Louisburg College art professor Will Hinton, at right. The mural is a depiction of the Louisburg Opera House with actual Louisburg folks walking down the sidewalk along Nash Street on a Fall morning about 1936. ONE FOGGY EVENING. 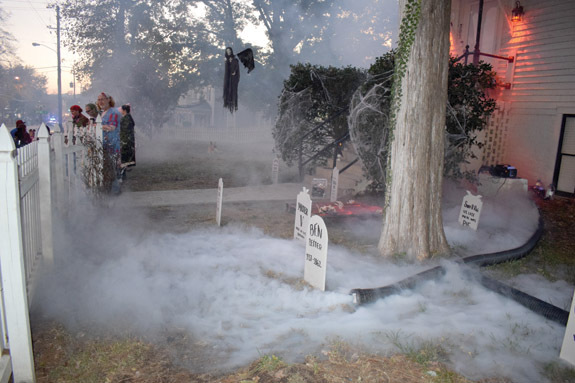 Homeowners Brandon and Jessica Vajanyi went all out with their Halloween set-up this year. From a homemade fog machine and tombstones, to scary images in every window, this stop was quite popular on the trick-or-treating route. MARIO TIME. Maple Springs Baptist Church in Louisburg held a Trunk-or-Treat Saturday at the church. 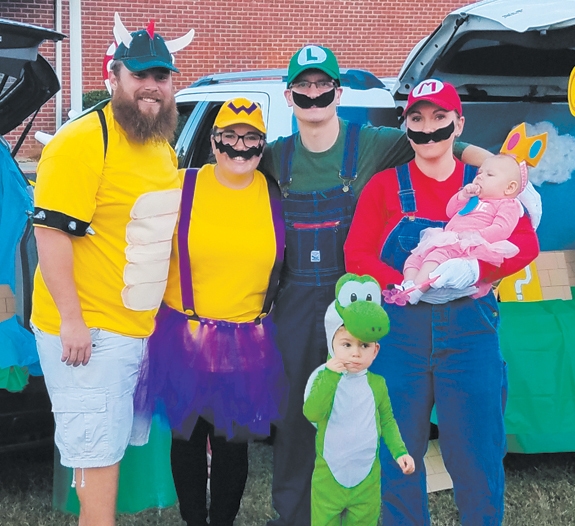 Participants decked out in Mario Brothers costumes were (left to right): Chris Hauser, Anna Inscoe, Todd Baker, Jennifer Baker holding Clara Baker. In front as the Mario Brothers character Yoshi, Oliver Baker. DOWNTOWN LOUISBURG FUN. 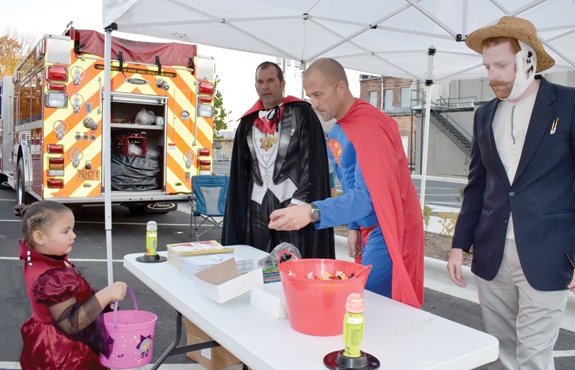 Town of Louisburg employees handed out candy and other goodies on Halloween. Trick-or-treater Laniya Wright, 4, of Louisburg, receives a treat from Louisburg Fire Chief Randy Lanham. At left is Louisburg Fire Station Captain Ramey Seal and at right is Town Manager Jonathan Franklin. 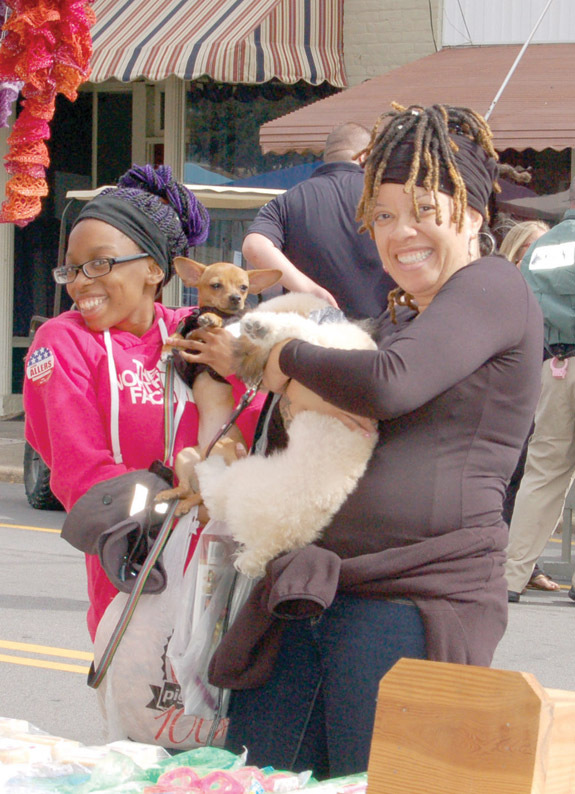 Frankenfest on Main in Franklinton was dog friendly on Saturday as Zenadria Henderson, left, with her dog, Hailey, and Tawanda Tucker, with her dog Quasar, check out the food and vendors in downtown Franklinton as part of the town's Halloween kickoff activities. LOUISBURG -- A Youngsville man died over the weekend following a two-vehicle wreck on one of the county's main thoroughfares. According to a report by Trooper C.R. Lanham, Bradley Skinner was traveling south on U.S. 401 about eight miles south of Louisburg when he apparently hydroplaned at about 3:50 p.m. on Sunday.